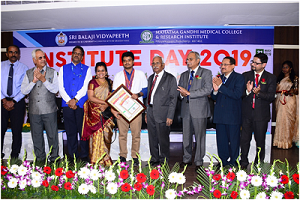 Mahatma Gandhi Medical College & Research Institute, a constituent college of Sri Balaji Vidyapeeth, Deemed to be University ranked one among the top 25 medical institutions in India by NIRF 2018 had its Institute Day 2019, on March 21st, 2019. 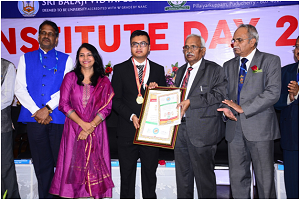 The Institute day is organized to encourage the students who excelled in their academic performance in the SBV Examinations. 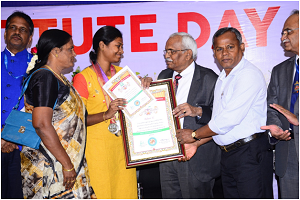 Prof. MurugesanVelayutham, Vice – Chancellor of Annamalai University, Chidambaram had participated as the Chief Guest and gave away the academic awards and prizes. A total of 117 students from MGMCRI, including 14 students from faculty of Allied Health Sciences received the awards and prizes for their academic excellence. The awards were given to first 3 toppers in the university examinations with gold, silver, bronze medals respectively. The students from batches from 2012 to 2017 received the awards during the day. The “Best outgoing student” was awarded to Dr.V.Balachandiranof batch 2012, Dr.Rakasri.R of batch 2013& Dr.Reubon Toi of batch 2014. 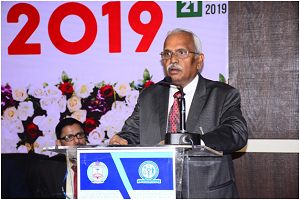 Speaking at the event, Prof. MurugesanVelayutham, the Vice-Chancellor of Annamalai University, Chidambaram, congratulated all the awardees and their proud parents for nurturing their wards. He drew the attention of all present informing that China has overtaken us in the field of research and publications. The main reason behind this is that the western world is nurturing the importance of research among their students, which is lagging in our country. He stressed for inculcating research into the minds of Undergraduate students which is filled with innovations. He also emphasized the concept of Artificial Intelligence and Black Chain mechanisms has to be taken up by our undergraduate students. Students research should concentrate more on non-communicable diseases and the publications arising out of these should be published in peer-reviewed quality journals. 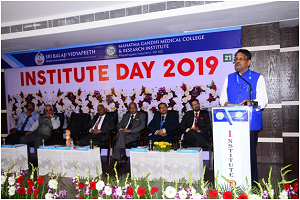 He also advised the faculty and students to keep abreast of themselves with the day today changing trends in the field of medicine. Prof. Subhash Chandra Parija, Vice-Chancellor of Sri Balaji Vidyapeeth, congratulated the students and their proud parents for receiving such recognition. He emphatically stressed that SBV is giving more importance to the research culture especially among the young students. The planned first Research Conclave of this kind is a very new concept for a young developing medical university. The lacunae of converting the postgraduate dissertations into publications among the postgraduate student community at the end of their course are being taken care at SBV and workshops for converting dissertations to publications has been started to guide the students to publish the outcome of their research in quality journals. He further said that SBV would collaborate with Annamalai University in the field of research in utilizing their cherished experiences by the young minds of SBV. The Dean of MGMCRI, Prof. Ravi Shankar M presented the Annual Report of MGMCRI for the academic year 2017-18. Prof. Partha Nandi, Vice-Principal (Students), welcomed the gathering and Medical Superintendent, Prof. NirmalCoumare thanked the gathering.